Photo courtesy of USDA NRCS, Texas. Adopting a plant-rich diet is one of the top things we can do as individuals to help slow climate change, but can some of the most popular foods fit into such a diet? Cheese, ice cream, bacon and eggs—did we mention cheese? We’re happy to share that many climate scientists and agronomists agree that more sustainably produced dairy, meat and animal products are possible; some even say that animals are an essential part of a thriving, regenerative farming system. The potential lies in pasture. Silvopasture, to be precise. “Silvo” comes from the Latin for “woodland” or “forest,” so silvopasture literally translates as “forest pasture,” and that’s pretty much the idea. Pastures that are at least 20-30% covered with trees sequester five- to ten-times as much carbon as treeless ones (which, by the way, are the current norm). For this reason, and more, Project Drawdown puts a transition to silvopasture at #9 on their top ten list of potential climate solutions. The climate benefits of trees are well known. Trees take in carbon dioxide and release oxygen, storing carbon in their roots and trunks—but silvopasture is even more special because the natural behavior of grazing animals improves the soil’s ability to hold onto that carbon and absorb even more. As they graze, animals drop their manure and work it into the earth with their hooves, naturally fertilizing the pasture. This nourishes healthy perennial grasses that also sequester carbon. The animals chew those nutritious plants down to the ground, making way for fresh growth (and more sequestration). When fully implemented, silvopasture systems may be able to offset the methane and nitrous oxide produced by grazing animals, making these farms potentially carbon neutral. That is a HUGE accomplishment in livestock farming. Silvopasture can be expensive to implement and takes time to establish, but the long-term benefits to farmers outweigh the initial costs. Animals in these systems have access to better nutrition and shelter from the elements, making them healthier and more productive. Farmers can choose to plant groves of fruit or nut trees as their tree cover, creating an additional source of income. Perhaps most importantly, given the projected challenges for farmers facing climate change, these systems are more resilient in extreme weather conditions. Remove the 20-30% tree cover from this system and you have what is employed by many farmers who currently produce grass-fed and pastured animal products. Managed grazing builds soil and groundwater health and sequesters more carbon than traditional grazing methods. The goal is to mimic the behavior of migratory herd animals in the wild, which leads to the creation of fertile and carbon-rich prairies. Attention is paid to how long the animals graze each plot of land, and how long the land rests before the animals return. At #19 on Drawdown’s list, this holistic approach is a step towards sustainable animal agriculture. Although improving animal grazing and pasturing methods alone would be unlikely to reverse climate change, these methods hold potential to mitigate some of the climate impact we will see if current global dietary trends regarding meat continue. 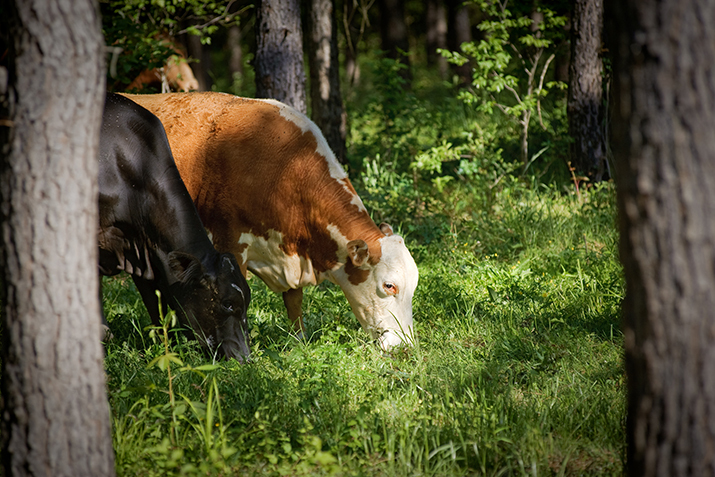 Although there isn’t a “silvopasture” food label, food co-ops carry a variety of grass-fed and pastured beef, pork, dairy and eggs, designations that indicate that animals are cared for in ways that are dramatically better for animal health, human health and the environment. Co-op staff can help you find more information.